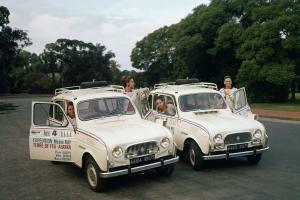 Renault belongs to a very elite club of France's oldest car builders. Only Peugeot and Mercedes have passed the 120-year milestone. This rare feat shows that the car has its roots in Europe. And more specifically… in France. Being 120 years old means having lived through a century full of tragedies, pitfalls and uncertainty. As well as hope. The fact that Renault is part of this triumvirate is in itself a victory. It is evidence of its ability to adapt on an ongoing basis to ever-changing economic, social and political conditions. Time and again, it has overcome major crises, questioned its methods and bounced back. 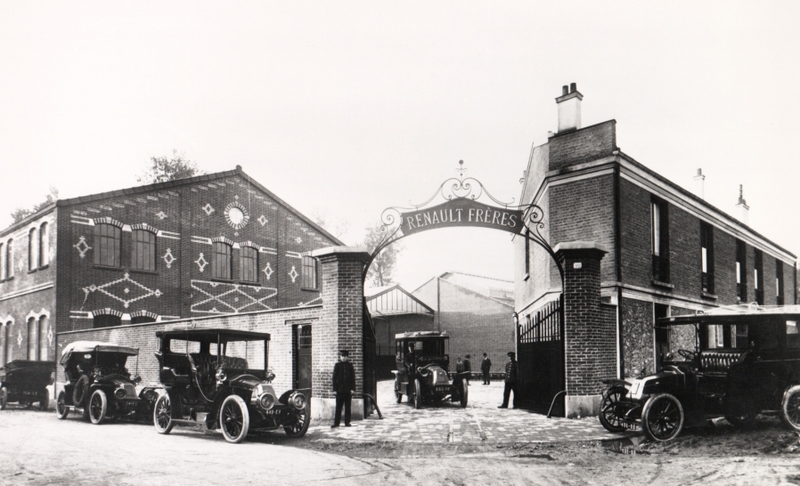 Renault has had three lives: nearly half a century under the aegis of its founder, from 1898 to 1944; then the period from 1945 until 1995, during which it was formally nationalised as Régie Nationale des Usines Renault; and the current Renault SA period, where Renault is a key partner in an alliance alongside Nissan and Mitsubishi. Renault was born in 1898 when Louis Renault invented a revolutionary new direct drive gear. 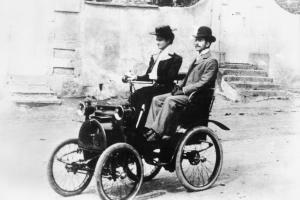 Right from the outset, it established itself as one of France's most innovative companies, patenting numerous inventions: turbocharging (1902), the removable spark plug (1904), the compressed-air starter (1906), the dynamo (1914), engine suspension (1921) and the mechanical brake servo (1923), to name just a few of the early ones. Louis Renault was a completely self-taught inventor and spent a great deal of his time at the Boulogne-sur-Seine family-owned workshop in Billancourt’s residential district. Once he had finished building his very first car – powered by a De Dion-Bouton engine –, a race was held on the Rue Lepic (which leads up to Montmartre). This led to the very first orders for his Renault Type A Voiturette. Without knowing it, Louis Renault was already marketing his cars. He carried on promoting them by successfully competing in France's very first motorsports competitions. Then just as cars were beginning to be mass-produced, he started using posters to advertise them. He was one of the first to set up a car showroom on the Champs-Elysées in 1912. Renault still has a presence on the Champs-Elysées – the Atelier Renault. In 1902, Renault built its first engine: a two-cylinder available in two sizes: a 14 hp 1728 to 2288 cc, and then a 2540 cc four-cylinder. The make was innovating all over the place. In 1905, it developed a taxi. And then in 1908, it built its first six-cylinder engine. 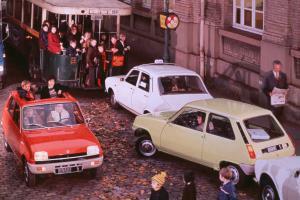 This was the backdrop for this first period of Renault's existence: a cornucopia of models spread over all possible segments – from popular cars to luxury cars. 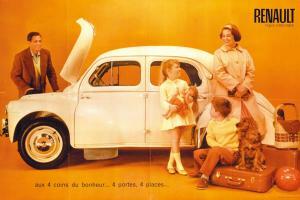 But one common denominator linked all of these models: Renault cars were cars for life and for living. The manufacturer's second era began in the first few hours of the German Occupation. Right up until the Liberation of Paris on 25 August 1944, Renault actively collaborated with the Germans – as encouraged by Pétain. The finishing touches were put on the 106 project – which ultimately led to the Renault 4CV – during this dark period. On 16 January 1945, the provisional government decided to nationalise the Renault Automobile Company. 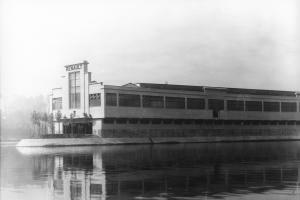 The Régie Nationale des Usines Renault was created under the leadership of Pierre Lefaucheux, an engineer who had graduated from the École Centrale des Arts et Manufactures and been awarded the Order of Liberation. The 4CV project was ratified. Renault, which by that time had become a national standard bearer and a genuine social laboratory, started mass-producing its vehicles. When first unveiled at the 1946 Paris Motor Show, the 4CV was seen by more than 800,000 visitors. They clamoured to see this little car which looked so out of place with its sand-yellow tint. The newly-nationalised Renault was greatly inspired by the reaction: instead of just concentrating on helping to get everyone on the road, they set about creating new segments. Thus were born the Colorale – a forerunner of the people carrier –, the Floride – a cabriolet that was launched with great pomp in New York as the Renault Caravelle, the Renault 4, then the Dauphines and the Renault 8, which had souped-up Gordini-engined versions and could be recognised by their blue tint and the couple of thin white stripes running from front to back along the hood. The Renault 8 Gordini gave birth to a Cup, in which a whole generation of future champions cut their teeth. Renault really was all about innovation: the Renault 16 launched in 1965 revolutionised the saloon car with its two-volume compartment and hatchback; the Renault 5 was the first versatile city car; the Renault 5 Alpine, was one of the first mass-produced hot-hatches. The Renault 30 saw a return to 6-cylinder engine design. Inspired by its Formula One victories, Renault became one of the promoters of the turbocharging for the series. But that did not prevent it from inventing a number of new concept cars. These included the Espace, the Twingo, the Scenic and the Vel Satis. For the past 120 years, Renault's creativity and its imagination have been the driving forces behind developing and improving the automotive sector.